Historic center, a terrace over the city and the river, lift, A/C, parking. Facing the river, in the heart of the World Heritage site and the antic shops area, in a building dating back to 1793 completely refurbished in 2013, on the 4th floor with private elevator,and A/C, a luxury apartment (100m²), very calm and bright, comfortable, elegantly decorated, with a terrace offering an amazing view overlooking the city, the river and its bridges, hosting up to six people. 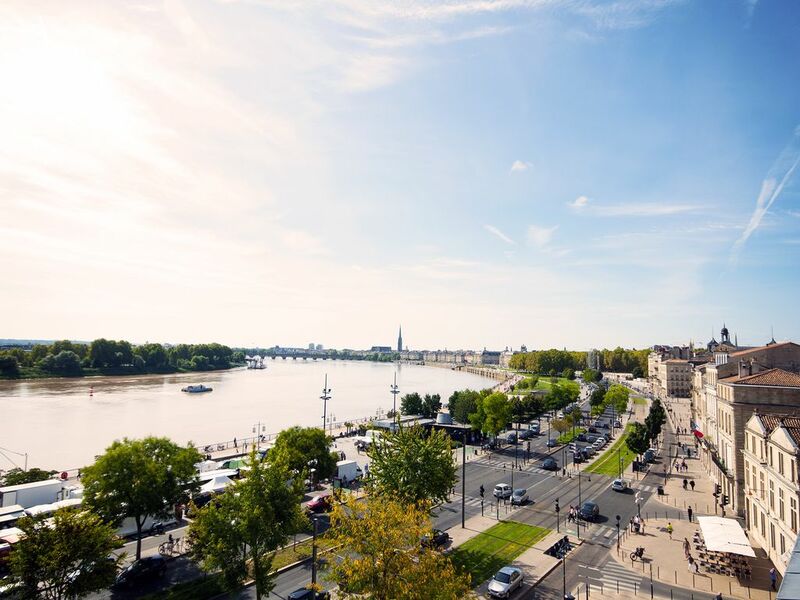 The flat has a prestigious and very central location, tram on the doorstep (direct to train station, Congress hall and Exhibition Center of Bordeaux-lac). Tourist office, all shops, many restaurants and main sightseeing attractions at walking distance. Flat including a large entrance, a 40 m2 living room giving onto the terrace, with one sofabed, a fully equipped open kitchen, (with oven, microwave, dish washer, coffe machine...) one bedroom (16m2) with one queen size bed et one bedroom (18m2) with three single beds, a large bathroom with double basin, shower and spa bath. Parking space in building garage: 10 € per day. Secured access to building with badge and videophone. My husband and I live in the apartment below which is very convenient and allows easy and friendly contact with my visitors. I am half English and perfectly bilingual which highly facilitates communication. We take pride in our property and are responsive to any of our renters needs. We have lived abroad for many years and still travel. We have therefore transformed and decorated this flat as if it were for us. We have given it all the practical details we like to find when we rent abroad and are seldom found in a holiday rental, such as high quality material, personalised decoration, perfect sound and heat isolation, A/C, separate jetted bath and shower, controled access to the building, private lift, parking slot in the building, a good internet connection and of course all the help you wish to organise your stay in our beautiful city. I have a personal website - www. chartrons37.com - where I tell you all about the city, the area and the apartment history. I also give all my secrets about where to eat, what to do, with or without children, my favourite places and activities ... If we are away, my very reliable help, Cathy, will look after you very efficiently. Few holiday flats in Bordeaux have both views to offer, one panoramic view over the River and one, from the bedrooms at the back, over the ancient roofs. Peace and quiet is total, however the city you are here for, its animation, buildings, distractions, is on the doorstep. Linen changed regularly according to length of stay. 14m ² overlooking the city and the river. For long term rentals, linen (sheets, towels ..) is changed weekly. Cleaning end of stay is included. Optional cleaning during the stay on request. This is a super apartment. Stayed here while attending the UGC tasting. Perfect location with a wonderful view. Everything that a busy traveler needs. Highly recommended. Perched high above the Garonne shortly before it flows into the Atlantic, the apartment is perfect for anyone who wants to either while away the hours watching the river traffic from the huge balcony or plunge right in to the exciting city of Bordeaux by hopping on the tram (which is only a few steps away from the apartment ) or walking along that same river. The apartment, located in the now very trendy Chartrons District, is beautifully furnished and impeccably clean with lightening fast internet,a huge modern bathroom with separate toilet compartment, a large dining table and a lovely well equipped kitchen. Include the added bonuses of a washer/dryer combination and air conditioning in every room and you have perfection. Bernice, who is the epitome of Gallic charm, can't do enough for her guests. She has stocked the apartment with guidebooks and maps to make exploring Bordeaux easy. At the risk of being redundant, I will not repeat what all the other reviewers have posted. I will simply say je suis d'accord . Merci Bernice and Georges for an absolutely wonderful second visit. As we said before, we will be back. I am so incredibly touched by your kind words. Yes I do my best for everything to be as smooth and comfortable as possible for my visitors. I keep looking out for new details to be improved. I take a great pleasure in doing this. And words such as yours make it all worth while. If you do come back a third time, it will have to be champagne! Berenice and her staff were very nice and graciously welcomed us to their beautiful apartment. The terrace has a gorgeous view of Bordeaux. The apartment is very comfortable. (Save the four floor walk-up - HOWEVER, good exercise after all of the delicious food and wine we consumed.) It was a very hot week, but every room is very nicely cooled with multiple, quiet AC units. We slept well. The location is spectacular. Everything is walking distance. Behind the apartment is Saint Louis-Des-Chartrons and a quiet square with a delicious collection of boulangerie, cafes and restaurants. Highly recommended. I am so glad you stay was a success. HOWEVER, THERE IS A LIFT and I cannot understand why you did not use it as everybody else does. It is small but takes two people at a time very easily. You must come again to try it! Fabulous 2 bedroom apartment in great location with excellent service from owner, stayed with my wife and 2 teenage daughters, plenty of room and great balcony with views,highly recommend! We very much enjoyed our stay at the flat. The location was very convenient and the accommodations were very spacious and comfortable. The terrace provided a picturesque view of the city's riverfront. The Sunday market directly across the boulevard along the waterfront was fantastic, with a smaller version on Thursday. The metro/tram stop was right near the apartment, although we prefer to bike in the city to see the sights. The city bike docks were right there as well, so that worked out very well for us. We had the good fortune of being there at Bastille day that provided an excellent vantage point for viewing the rather impressive fireworks show. The apartment is very secure and parking for an extra fee is available on-site in the garage below the building. Adhere to the car size limitations as stated and you'll find it very convenient (we had a VW Golf 4-door hatchback that had no issues with the space). There is much to explore near the apartment as far as restaurants and shopping. But also it is not far from the vibrant city nightlife scene. Our stay was for 4 nights, but we could have easily done a week in Bordeaux, as it is a beautiful city with much to offer. I would recommend it. Perfect apartment for 2 couples. Toilet and shower were in separate rooms which made it easy to get ready in morning. Nice coffee maker and plenty of tools for kitchen preparation. Washer/dryer was an added plus. We stayed 3 days before our rivercruise and loved the location, just walked across the street to board our ship. Berenice has all the brochures for exploring the many attractions around Bordeaux. She speaks great English and was able to help us with all our questions. Thanks for a wonderful time, can't wait to return! Facing the river, ideal base for sightseeing in the heart of World Heritage site. In a building dating back to 1793 completely refurbished in 2012, on the 4th floor with private elevator and A/C, a luxury apartment (100m²), very calm and bright, comfortable, elegantly decorated, with a terrace offering an amazing view overlooking the city, the river and its bridges, hosting up to six people. The flat has a prestigious and very central location, tram on the doorstep (direct to train station). Tourist office, all shops, many restaurants and main sightseeing attractions at walking distance. easy access to the Congress Hall and the Exhibition Centre (10 mn by car). Flat including a large entrance, a 40 m2 living room giving onto the terrace, with one single bed, a fully equipped open kitchen, one bedroom (16m²) with a queen size bed et one bedroom (18m²) with three single beds, a large bathroom (10m²) with double basin, jacuzzi and separate shower. Une caution de 300 € sera déposée à l'arrivée et rendue à la sortie. Pour dégressifs longs séjours, nous consulter Supplément de 15 € par nuit par personne au delà de 5 pers A security deposit of 300 € will be paid upon arrival and given back upon departure For long stays, please ask for special rates 15 € per pers/night above 5 persons.